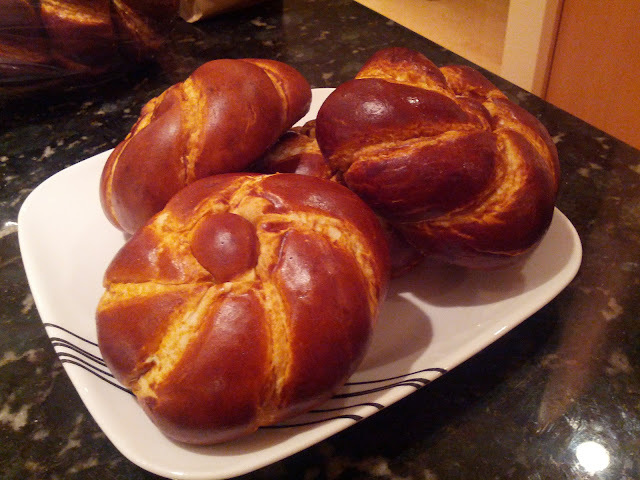 In my last post, I raved about the pretzel bread buns used at the Hole in the Wall Burger Joint. I was chatting with the owner when I was there and he said they used Dolce Forno Bakery. All the lights in my head immediately went flashing like an ambulance. I know Dolce Forno also supplies the bread at the wonderful LA-based sandwich mini-chain, Mendocino Farms. Now, I'm seriously motivated to seek out Dolce Forno! Dolce Forno Bakery is owned and run by the Drago Group (in the same family as the famed Downtown restaurant Drago Centro). It wasn't easy finding the bakery. It's tucked in a street that has to be accessed via an alley behind a Del Taco off of Venice Ave. and Robertson Blvd.! But once you find it, you'll be rewarded with heaps of pretzel bread, classic Italian breads, pastries and desserts. 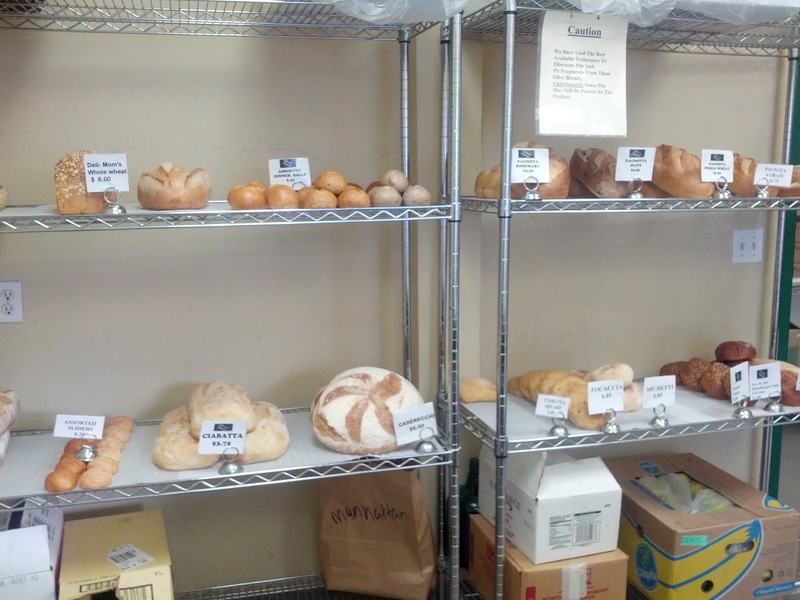 The bakery is not your typical retail shop. It's sparsly decorated because it's really just the front counter of an entire baking operation in the back that supplies some of the best restaurants and hotels in Los Angeles. Here you'll find several kinds of dinner rolls, baguettes, classic Italian breads like ciabatta, focaccia, panini, pagnotta, filone, casareccio and more. I read that Mom's Whole Wheat Loaf is a must-try too so I have to get that next time. If you go and it's late in the day, call ahead to make sure they still have what you want. This is their must-buy Pretzel Twist. Dolce Forno has replaced Rockenwagner as my pretzel bread go-to. Use the Pretzel Twist as a hamburger bun or just eat it plain and enjoy it's slightly salty and chewy exterior and moist, doughy center. Or, enjoy it the way I do which is to slice it in half horizontally, heat it for ten seconds in the microwave and then spread some salted butter on it. PURE CARB INDULGENCE. Oh, and did I say it's only 85 cents each?! Dolce Forno also carries a small variety of muffins, danishes, Italian cookies and my favorite Chocolate Chip Cookie (after the ones I make of course, haha). It's crunchy around the edges and soft and chewy in the middle. 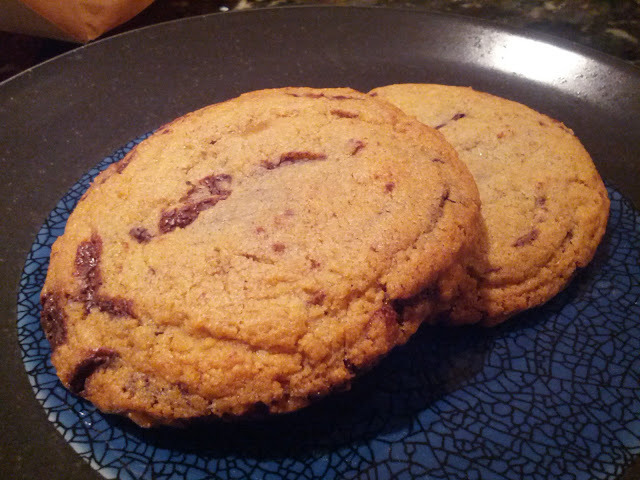 I almost want to call it a Chocolate Layer Cookie because its got ribbons of chocolate layered throughout the cookie. I can probably eat ten of these in one sitting especially since it's only 95 cents each. Besides breads and pastries, Dolce Forno sells their housemade dried pastas (i.e. linguini, fettuccine) and 2 to 3 varieties of frozen ravioli. 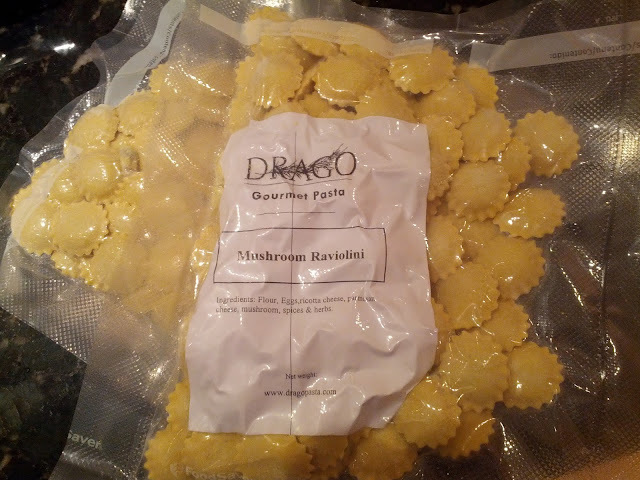 I bought a 5lb bag of their mushroom ravioli and divided it myself when I got home. One pound will serve about 3 to 4 people depending on what else you're serving and it only takes 5 minutes to cook. I love having restaurant-quality food at home. I can't believe Dolce Forno doesn't have a bigger retail shop. There are some good bakeries scattered around Los Angeles but with our infamous traffic, it is insanely hard to get to the handful or so good bakeries to buy good fresh breads and pastries. I refuse to believe the market doesn't demand more amazing bakeries like this. Are we really such an anti-carb obsessed city? *Direction Tip: If you follow the directions on Google Maps, you will not find the bakery. I've filed a bug report with Google but while they're fixing it, it's best to use Mapquest which has it right. You access the alley right behind Del Taco on Venice/Robertson and you'll see street signs for Willat Ave. and Hoke Ave. Limited street parking and the Dolce Forno sign isn't very big so don't blink! *They specialize in cakes though they do have some pastries, cookies and great cream puffs. They have the best cakes in the city! They use whip cream frosting instead of heavy, sugary buttercream and have done wonderful cake designs for me.